....About Us is talking about my family history and the game of baseball starting from those baseball playground days growing up as a once cotton top lad. This telling and sharing of many memories about the game of baseball from those early days at recess in my small hometown of Argo, Alabama. Sharing with you my thoughts centered on and about baseball with the many lessons learned from the playing fields being retold as Baseballfarming. My cobbled together website "About Us" here at Baseballfarming hopefully will build greatly upon your growing interest about our game of baseball. Family history thoughts spanning from those early years, as a young tow head enjoying baseball, concluding with the Marine Corps career of Major Wiley B. Channell United States Marine Corps (Retired). The family name of Channell which by most all accounts, has a fairly assured jolly ole England or French origin, has fascinated me throughout my life. May you take a real deep liking "About Us" and "Baseballfarming" catching your fancy, with this introduction leading you to enjoy fully the World of Baseball. Come aboard visit here at our about us page gaining a feel for how baseballfarming was generated from real life experiences thus you have About Us and Baseballfarming. Growing up with grand country roots in Argo I was privileged to learn about living and ball playing on the playgrounds of Argo grammar school. Then too about us as Baseball was Cricket in Micklewrights pasture. Memory recounts the learning and growing under the tutelage of the most dedicated teachers’ on the face of the earth from Argo Grammar and continued at Trussville Elementary and Hewitt High School. "My Turn" brings to mind the "batter up rule" which was one playground rule of baseball as well as ones choices in life are so similar which is often forgotten. Youngsters on the playground even siblings in a family must learn that, in due time they will get their turn at bat as well as other events and right of accomplihments within their lives, but sometimes they just have to wait their turn. The batter up rule guarantees all of us that we too will get our turn. Doubly blessed was I for when it was "My Turn" to go to college which allowed me to get "my turn" for higher education was the opportunity to attend Auburn University. Graduation from Auburn in 1959 providence again truly blessed me, with another honored privilege which allowed me to become a Marine Officer, to serve a career in the United States Marine Corps. Telling About Us the Channell Family and talking both about us and baseball has been a joy. 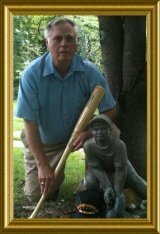 My website sharing information all about the game of baseball with fans and players around the globe is now my cup of tea and good fortune. The introduction about us means you will also be invited to think about how you might also allow your life experience, stories or anecdotes to be shared. You too could introduce yourself to the good people at SiteSell.com and SBI and like this country boy get started with your very own story on your exclusive very own website. Websites may fill cyberspace with hundreds of thousands of subjects attracting attention but has it told the story about you or about us? Knowing something "About Us" and how it relates to Baseball gives an opportunity to feel a kinship with baseball by knowing about this person who is talking the talk about baseball. --I will begin by letting you know. My Mother and Dad both grew up in our small rural, family centered and oriented, community of Argo, Alabama which was an idylic setting with life about us growing up in a rural or country living. Mom was the daughter of Birdie (Keith) Liles and the first child of the extended family of William Daniel Liles. Dad was the son of Nancy Virginia (Rice) Channell and John Monroe Channell. My maternal Grand-dad was a master brick mason by trade and a Seventh Day Adventist by profession of faith. My mom, due to the desire and urging of my Grand-Dad Liles was socially and in every phase of life was raised and schooled in the Adventist schools. Grandmother Liles (Birdie Lee Keith) was a homemaker while Grand-Dad Liles was a building tradesman following construction work as a Master Brick Mason. My Grand-Dad Liles a staunch beliver and keeper of Saturday as the Sabbath brought up all of his family in the understanding of the Seventh Day Adventist Church. Never working on the Saturday as the Sabbath and as a trade craftsman not having gainful emploment in most part on Sundays. This meant that Sundays were his days to work on projects building and repairing all around his own properties. Most times without fail on Sundays as a young cotton top country boy lad you might find me trying to keep up with Grand-Dad Liles around the house and farm. My paternal Grand-dad John Monroe Channell was a small acreage farmer throughout his life which set the mark for which my Dad followed as a produce buying and selling merchant. Granddad from his youth was Baptist by profession of faith. My Grandmother Channell (Nancy Vitginia Rice) was a homemaker while Grand-dad Channell a farmer who tilled the land. He would take his fresh grown goods to market which was his entire livelihood except when he bargained for or traded home places. Let me tell you one thing about us from the beginning my Grand-dad Channell did not put a whole lot of stock into time off for playing ball. This baseball playing was never a Grand-dad to Dad to Son thing. During my Grand-dad Channell and my Dad’s era it was a customary thing for siblings to remain and work on the farm until they were ready to marry and start their own families. So it was with my Dad. When Dad and Mom married they struck out on their own to raise a family and provide a life together. Dad started his family at and during the onset of this country's Great Depression which was a hard economic time for our entire Nation. My Dad by circumstance never had the family urging nor opportunity to play sports and participate regularly on ball teams. He was a good fan and was most pleased and proud of his sons when they played ball. Dad quickly realized the life of farming could be improved if he would buy from the farmers as they brought their goods to market and then to resell at a small profit. This change my Dad made significantly changed our lives. Although, my brothers sisters and I, grew up in a rural environment we were exposed to the world away from the agrarian/farm lifestyle. The hustle and bustle about us and family owned business of buying and selling and commerce traffic,being exposed to the general public on a daily basis, was a huge factor about us kids as we grew up. Dad, becoming a fresh fruit and vegetable produce operator buying and selling instead of a farmer, meant we were all just one generation removed from the farm and tilling the good soil. My Dad needed no textbook to follow about marketing such as the laws of supply and demand and such his knowledge of the produce business was gained by doing. Proudly I might say without fear of contradiction, "My dad knew the total essence of a free market system of the fresh fruit and vegetable produce business." The produce business world requires following the season and the growing areas of our great country. While dad started outas as a young man just married, he would take his truck to Tampa, Florida starting around February of each year to start hauling fresh market produce from Tampa to Birmingham. In those days and times much produce was being raised in Cuba and brought via ships to Florida and the Tampa Bay market. Produce being grown in Cuba due to the tropical climate was seasonally well ahead even of goods planted in the Southern States. Commencing about March , the early crops would start in the south Florida areas around Homestead and Pompano Beach. Dad would haul from Florida selling produce wholesale on the market in Birmingham and to the Grocery Store Chains such as Hills Grocery Company and A&P Stores of Birmingham. April/May each year produce in the south Georgia area and markets of Cairo and Thomasville, Georgia would be in abundance so dad would start hauling from the south Georgia markets to Birmingham. June each year Alabama home grown produce would become available in abundance so the buying and selling of local Alabama vegetables with all varieties of home grown produce were bought and sold on the Birmingham market. Buying and selling local home grown produce took place until well into the fall season around September. The sommers was about us all working with Dad on the Birmingham produce market. Beginning early fall would find Dad heading into the Carolina’s bringing apples, beans and other produce into Birmingham. The opportunity to buy late market Alabama okra and peas also found dad buying loading and going north to Louisville, Cincinnati, and as far north as Chicago with peas and okra. Selling his load going north, he then would head over to Benton Harbor, Michigan to buy and load grapes, apples, Indian squash and gourds and back into Birmingham with his load. The "Season," the "Market" and the "Prices" of marketable produce all change with the season, the place, and the price and all come and go like the wind. I would say that this merchant trader commercial enterprises my Dad taught all of us kids was a contributing factor in our lifelong endeavor of always thinking about buying and selling. Baseball playing brings home the point that playing sports to win is like doing business the object is the winning. In business success is built on the win win principle. The same should apply in sports play to win but your opponent should not be vanquished for he also has a need to win. Mom was busy, as a homemaker, raising the eight (8) of us children and preparing us to help at the family owned grocery store and everyone getting his turn helping Dad with the produce business. Seven brothers and sisters. They are Bill, Bob, Betty, Brownee , Bailey, Barney, Ben, and Brenda. Only eight, so we fell one short of being able to field a complete baseball team. The six boys were prone to sneak off and get involved in baseball games on a routine basis. Bill and Bob being twins and the oldest set the standard for us coming on baseball chasers to follow. There was work and then there was also our ball playing. Mom always knew where she would find us if we were not under foot at the store. We had slipped off and had a baseball game started in the neighborhood. --During the midst of World War II I began school in the first grade at Argo grammar school. We lived in what was at that time a rural area of Jefferson County, Alabama. As you may well imagine, Argo community had no neon flashing lights and as a matter of record, the main highway from Chattanooga to Birmingham and on down to New Orleans. I suppose you could sum it all up by saying about us youngsters and baseball it was not up town, we were not. Up beat, happy and living the good life with friends and enjoying recess time at school, we were. Grammar school at Argo was two rooms of hard at it studying and learning Reading, Riting and Rithmetic. Grades 1 through 3 were in one room and grades 3 through 6 in the adjoining room. Our grasp of the learning process consisted of more than reading about history and figuring how to subtract and divide. The teaching also involved how to be a good citizen and how to belong in society with respect and sharing. We even taught history by reenacting the stories with staged plays. To be Captain John Smith or Governor Bradford was cool. Even our time at recess was part of the learning curve. You can believe that tall sixth grader let the fourth grade worry wart know when it was his turn to bat. There was no breaking in line and going before your turn. Playground ball playing at recess time was one of the best teaching training and learning venues this ole world has ever known. This is one element about us and of societal learning which today is coming up, I believe, a little short. Today everything is just not about us growing up with our peers it is adult supervised and controlled and micro-managed. Kids teaching other kids is now all in the past those days are long gone. So now we have baseballfarming to rekindle some of those same methods of education. With sufficient and solid start on my education path from Argo grammar I then had the opportunity to join a larger and faster crowd in the sixth grade by being enrolled at Trussville elementary school. Now my horizons were expanding and Mrs. Brown, my sixth grade teacher, instilled the value of paying close attention for the lessons were more intense. Trussville schools in the late forties and early fifties were elementary school, finishing the sixth grade then directly into the high school with grades seven through twelve. The pace quickened considerably. The crowds of high school now seemed huge. Lucky for most of us during these years of high school in the early fifties, we were taught and learned our citizenship lessons directly from the upper class men and our peers. When an upper class person spoke or acted we watched and listened and followed the correct example. You might be a cracker jack good athelete and a real whiz bang but there was such a thing as hold your horses hot shot you will get your turn. This was schooling at its best. Hewitt-Trussville High School was a real life experience and example of dedicated teachers’ intent on providing to all of us including the Channell kids’ the best they could offer. The school or faculty and the school board were backed by a couple of generations of parents as former students. The curriculum was progressive and top notch. Advanced courses were offered which qualified students to receive a pre-college instructional level education. Graduating from Hewitt-Trussville High School class of ‘54, it was on to Auburn University with a lot of my school chums. At Auburn, as at most other Universities, all the incoming freshmen are subjected to a battery of tests. Tests are needed to honestly evaluate incoming students and advise as to which courses of study would be best suited for his or her academic abilities. My entrance battery of tests revealed that I would be best suited to study and to major in Business. Mr. big shot Brownee Channell thought he knew better; he wanted to study Engineering. After all I had been around the produce business all my life and I already knew that if the market were short of peas the price of peas would be up. If every produce house in town had a load of peas the price of peas was going to go down. I thought I did not need the Cotton Mather economic theories of supply and demand and concept of bullets or butter. I have since learned what I thought I knew was not the whole measure of the truth of the matter. Many times now I have the oppportunity to tell youngster who are in school, "Sit on the front row and pay attention." This hard headed country boy soon found out studying Mechanical Engineering required a keen “want to” about the subject to conquer the real knowledge underlying principles and their application. Struggling through most all the mathematics courses up to include “Differential Equations” and all the really tough Physics classes, I finally had to say “Calf Rope” yes I changed my course of study. The truth teller for myself was a physics lab class where we were in the experimenting part of determining where a wire was most probable to break, when I realized, “I really didn’t have a yearning for learning the intricate subtle Laws of Physics." Aside from the academic endeavors at Auburn, there were some other aspects of my dear ole Alma Mater "Auburn University" which I know significantly added to this one Channell boys perspective on life and my world. Auburn University, (Formerly API or Alabama Polytechnic Institute) being a land grant school, required at the time were certain mandatory classes and participation which were an absolute concrete requirement. Every male student was required to participate in the ROTC program. The ROTC program was the “Reserve Officer Training Course” allowing me an indoctrination as to the aspects of our military probable future needs. The other program was the mandatory two years of physical education (PE) for all male students. The elimination too a voluntary participation of these two items from the mandatory curriculum in my estimation is a real shame. I can in all sincerity report, “ My participation in both of these activities as a mandatory part of my degree from Auburn has repaid me many fold throughout my life, from that day to this. Graduating with the class of ‘59 was offered the opportunity to go directly into the U.S. Marine Corps Officer Candidate Course (OCC) at Quantico, Virginia. This began a Career for which I am deeply honored to have been a part. 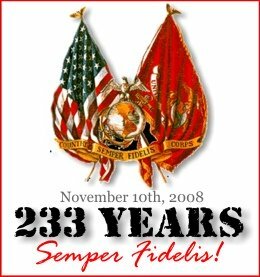 United States Marines proudly lays claim, which is a true and often quoted saying, "Once a Marine always a Marine." Family and the U.S Marine Corps. -- Leaving Auburn, it was time to start my venture into the world and make my home with a wife of my dreams. I was fortunate in meeting a young lady by the name of Robbie Jack Amerson and she consented to be my wife. Together we stepped out on this new life which at that time also included the U.S. Marine Corps. This once cotton top lad from Argo, Alabama, and Robbie Jack from Berry. Alabama, found out quickly that being married and the one person single decision was not what being married was about. Marriage and two lives quickly become a two decision crossroads. It never was going to be a one way street again. After almost a half century together, I suppose if she agrees, we will do our best to make it a full century. There is a standard saying which every Marine has heard many times, "If the Marine Corps had wanted you to have a wife they would have issued you one." I can say without contradiction, Robbie Jack and all of our children were all part of this Marine mystique of honor so I guess they were "Marine Corps green issue." The Marine Corps for sure did not promise a rose garden for the Channell Marine dependents. I have lost count of how many times our young chargers changed schools. From one duty station to another was one thing but the Marines are deployed time and time and time again to places and clime where dependents dare not tread. The wife and children of a Marine are real troopers and quickly learn the duties of their Marine is part of the Honor of serving and having that title as a United States Marine. Upon being Commissioned as a 2nd Lt. at Quantico, Virginia the macho luster and thrill seeking siren call of flying aircraft and being a Marine Aviator seemed to beckon. The Marine Corps was glad to have volunteers for flight training as Aviators at the U.S. Navy Flight Training Center and Naval Base at Pensacola, Florida. The glamour and glitter of being a Naval/Marine Corps Aviator was too much for me to resist so to Pensacola and Flight Training I flew. The posters and hype of flying is great, but this Channell must hasten to add without the true love and burning desire for flying, please leave that avocation to those who yearn for it with all their being. My oldest brother, Bill, loved flying and soloed at Roberts Field, near Midfield in Birmingham, Alabama at the age of 16. He wanted to be a pilot in the worst sort of way but had to settle on serving a career in the Air Force as a Navigator Bombardier in the Strategic Air Command (SAC) with an excess of over 5000 flight hours in the B-52 Super Fortress Bombers as a guardian for America’s Freedom. I digressed to mention my older brother before telling, you more about us, that I decided to drop out of flight training. This admission that my passion to fly was not what one must have, was something Bill understood and never chided, even though he would have done a back flip for the opportunity I was giving up. I went from flight training back to Quantico as a 2nd Lt. to be trained to be a Marine Officer at The Basic School. Officer training at Quantico or Enlisted training at Parris Island or San Diego we are all throughly trained as Marines. Our indoctrination is both thorough and complete with the Espirit De Corps lelarned and never forgotten for you see this is where we are taught and learn to love our Corps. Nothing could be more true about us Marines "Once a Marine Always A Marine." Upon the completion of Officer Basic School each graduating shave tail 2nd Lt. puts down his three choices of (MOS) Military Occupational Specialty. One of my choices was to be Marine Corps Engineer Officer. I had mentioned in this about us earlier my disdain of formal Engineering study and the physics laboratory. Ironically I was assigned to be an Engineer in the United States Marine Corps. So lucky for me I did pay some attention to my Engineering classes at Auburn and it served me well throughout my Marine Corps Career as an Engineer Officer (MOS 1302). I have told you Robbie Jack was already now a part of this Marine Corps as family but she was really the mother for four (4) for which she reared properly. Her duty station at home is one of the most honored of duties. First there was ”Liz”, who married John and those two have given us Jack. Next was “CJ”, Cynthia Jean and Cindy prefers the single life being free as a bird doing and going as she pleases at her pace without adjusting to about us as having a like partner or the married life at present. Next was “Doug”, who married Laronda and those two have given us Taylor. Taylor is coming right along as a little league baseball player. Next was “Bo”, who married Carol Anne and those two have given us two boys both Zachary and John Liles. My book would be full if I provided the details about us on the four offspring all of which their mom Robbie Jack brought up to be Class A Citizens as a Marine Corps and Channell family. Marine Corps career and the experience of the Channells’ I would say was typical Marine Corps. Just like our Marine Hymn states "In every place and clime." East Coast Marine, West Coast Marine, Japan, Okinawa, Hawaii, Quantico, Cherry Point N.C., Fort Belvoir, Virginia, Washington D.C. Headquarters Marine Corps, and yes Vietnam. --Out of the Corps in 1979 what was a Marine Corps Officer to do? There was no strict attention to detail and soon it became apparent no one was paying any particular attention about us and my family it was sink or swim find it out the best you could for no one was in charge. It is almost like that first day way back there when you reported to the first grade in school. It was all so confusing and where were the family apron strings?. Every Marine being outdoors during colors will freeze in place and snaps to attention with a smart salute. The large Flag is briskly hoisted to the top of the Marine Corps Base, flag pole. By the way, about us in the military we call it 0800 hours. The first and foremost thing thinking about us as a non uniformed civilian I had to break my habit of is reaching for my “cover” or cap or hat to put on when I would walk outside a building. One thing a Marine will never do is to wear his “cover” indoors and never goes outside uncovered. This act of being covered outdoors and uncovered indoors is Marine Corps protocol and maybe should be an ingrained part of civilian populace ethics protocol. I suppose it was appropriate to give up my military habits and join the rest of the family gaggle of the civilian mob. One thing I would caution anyone leaving the military upon retirement is to simply do this, "start another career, do not just look for a job." Fortunate for me this country boy, my Uncle Sam, really not U.S. Government but my Uncle Sam liles actually my moms brother Sam Liles or “Uncle Sam” for he knew a company which needed my capabilities. When I touched base with Bethea National Corporation, sure enough, they offered me an opportunity and I seized the moment. Bethea National Corporation manufactured products which were used extensively throughout the Electrical Power Generating and Distribution Industry. We manufactured both iron and aluminum products in our two production foundries all located on the same property. Our products were produced, marketed, shipped and distributed throughout the United States. Products strung high in the sky on towers and poles holding the overhead electrical transmission and distribution lines transmitting power all across the nation and even across the street where country boy lives. Our products we manufactured at the plant in Pelham, Alabama are being utilized in every state of the United States. Every major Electrical Power Company has used our products which were manufactured in Pelham, Alabama. Everything changes, even the weather. During my nine years country boy was at Bethea the company was sold three different times. The last corporation which bought the company bought for the plant production capability only. Everything about the operation dealing with marketing, planning, engineering etc. was to be handled out of the new buying Companies Headquarters in Illinois. Except for production personnel and a skeletal operations management, most all of the company salaried personnel were caught like country boy in that ole bear trap called down sizing. This change in employment put this hometown country boy on the street again, so I took the bait and started to try this then that and doing nothing with a true fixed future. Looking back I know what would have been for me a great second country boy career. It would have fitted me to a fair the well, “Teaching school and hanging around the school ball fields helping the real professional coaches ply their trade. Hindsight is a great teacher and a way to learn, if you are fifteen going on thirty and country boy is going over half again a half hundred. My baseball playing career started and ended as a Country Boy on the country school yard, pastures and ball fields, no bright shining lights and certainly no All-Star hero status, but boy does Country Boy cherish the memories and talking about the Channell family and country boy baseball. Folks, I may have bored you enough but I do thank you for letting this once young "Cotton Top" country boy share about us with you and to rehash my past. Baseball coaches and managers ponder and pour over the batting order strategy for each and every game. Life in these times requires every country boy to do the same thoughtful about us preparation and the cause and effect we present to others. Everyday approach in our country boy work environment is the same parallel in that how we lay out our string of events is the surest way to completion of the tasks with desired winning results. This country boy when thinking about us and the personal feelings of everyday family living and the game of baseball are amazingly enter twined or should I say one and the same. Thank you folks for coming to my website here on the web and allowing me to share, some of my country boy background, about us with you. I take very personal pride in a glowing tribute my brother Bailey wrote titled Baseball Memories. Cotton Top country boy knew life with family in these times about us has fashioned it's self in such a fast pace and trying to be all things to all people can become a hectic rat race. If I might share this one other thought, about us and this feller from the country exposed to many parts of the world, it is important to take the time to smile and say hello to that down and out stranger in the byways. Going down this about us road of life is somewhat like this country boy playing a baseball game always trying to be a winner. We may make errors and bobble the ball but if we stick to the high road and "Believe" then we shall all be winners. Be a part of about us and being a part of the game of baseball making life more enjoyable and just maybe our sharing of thoughts together might be a blessing shared and given. It is some what awkward for grown men especially for this country boy to say to a perfect stranger “I love You” and say it with conviction. The teachings of Jesus while he was ministering here on earth, centered his teachings on the value of Love for all. By accounts of The Bible we are challenged, all of us, to Love One Another. I would like you to meet and enjoy doing business with my baseball business partners as well as knowing about us talking with you about baseball and the Channell family. 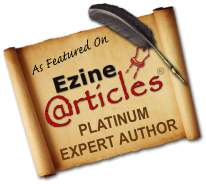 If it strikes your fancy that maybe you would like to have your very own website like this country boy to tell your own About Us story or to influence other things which people would enjoy.